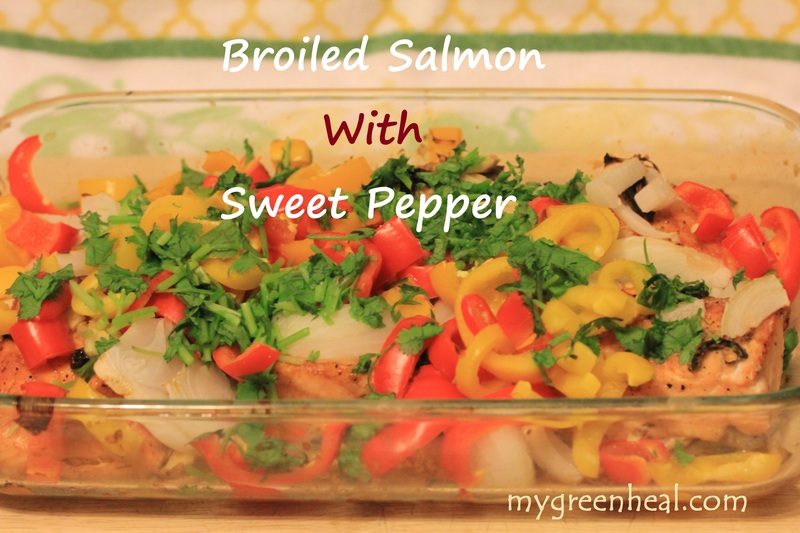 Do you love salmon? Me, I am a big fan of this seafood. Salmon is the first fish that I used to train my husband. My husband denied to eat seafood for 35 years of his life, until we met each other and I started training him to eat seafood. Now he is a big fan of fishes, shrimp, crab legs, lobster, oyster and you name it. Seafood is rich in protein, less fat, full of DHA, iron, zinc, Omega 3 and many more. So, consuming seafood is a heathy way to treat your body without working out. Step 2: Marinate the salmon: use salt and black pepper, let the salmon marinated while we do the prep work. Turn the oven to broil status. Step 3: Prep work: Chop and slice ginger and jalapeno to thin strings. Chop sweet peppers to half ring size. Chop the cilantro to small pieces. Step 5: First broiling: Put the salmon tray in the oven. After 20 minutes, get the tray out put all the remaining ginger on top of the tray. Put it back to the oven. Step 6: Second boriling: After 5 minutes, get the tray out, put all the chopped onion and sweet pepper pieces on top of the tray. Let it sit in the oven for 4-5 minutes. Now put the cilantro to the tray and let it sit for 1 minute. You are done for the salmon. Now the easy part is packing the lunch to the jar, I am sure you know how to do it. Mason jar is a wonderful item that you can use it for many purposes. I use a lot of the jars to store my dried food as well as canned food. I also love the decoration that mason jar offers while storing fresh food. 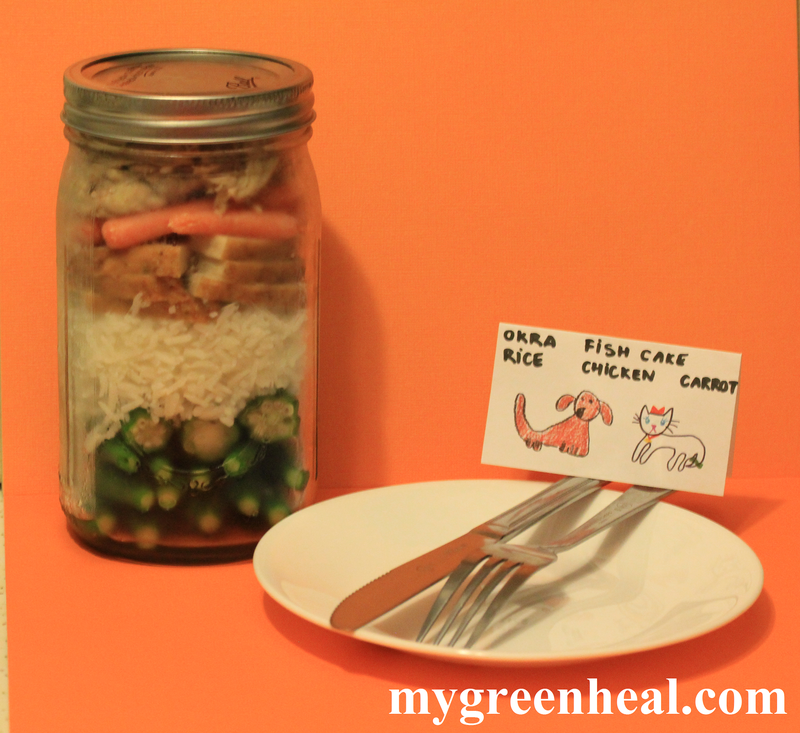 So as one of the Meal In A Jar fan, I would love to share you one recipe that I make for lunch. It is full of nutrition, provides you enough energy and it is healthy. Step 2: Cook the chicken breast: Cut the chicken to small piece, slice the ginger. Put all the ginger and chicken in one pot, season with salt, fish sauce and let’s cook for 20 minutes, you can open the lid if there is a lot a water. When the water is gone then the chicken is done. Step 4: Slice the fish cake to small pieces. Now all the ingredients are ready. You will need to nail them to the jar. Is that easy?